Earlier this week, Governor Bev Perdue’s office released a You Tube video hinting that she would be using her veto stamp more frequently in days ahead. Wednesday evening, just hours after criticizing Republicans for playing politics with an extension of unemployment benefits, Perdue made good on her pledge and vetoed two bills. Perdue rejected Senate Bill 265, which would have placed the State Health Plan under the Treasurer’s supervision and charged state workers and teachers a monthly premium for the first time ever. And her decision to veto that bill, which would have allowed community colleges to opt out of the federal student loan program, is earning the governor widespread praise. “North Carolina Governor Beverly Perdue took a historic step towards ensuring access to aid for the state’s community college students by vetoing House Bill 7. This issue is of critical importance in the state right now. With more students than ever seeking education and training at community colleges, North Carolina now ranks absolute last in the share of students with loan access in 2010-11 (as detailed in our new analysis to be released this month). While we don’t usually share such a major finding in advance, we wanted to call attention to the significance of Governor Perdue’s decision today,” said Shannon Gallegos, Communications Associate with the Institute for College Access & Success. To view the Governor’s veto of Senate Bill 265, click here. 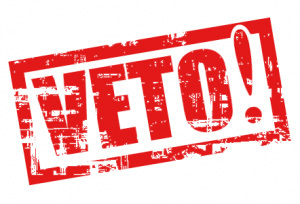 Click here for the veto of House Bill 7. This is a political move by Perdue to avoid a primary. The health system is broken and the state does not have to money to fund the $550 million debt. She has no way to come up with this money. She just wants the vote of teachers and state employees. There are no Profiles and Courage here. This is about a candidate that is at the bottom. She is using the debt crisis for her political gain. She cares nothing about making a better system that can pay for itself. She learned from the best and she will use every challenge to make gains for herself. My, but “frances” is prolific tonight. Deranged, but prolific. It’s also worth noting that the bipartisan/middle of the road NC Center for Public Policy Research issued a press release tonight praising the Guv on the community college bill. (The group had done a detailed analysis of the matter). I know you can not disagree with Democrats or the NC Policy Watch .The word has come to that organization and there is no ideas under the sun that could change their mind, even the truth. They always know what is right. But in the meantime, let me give you an example of real life situations in North Carolina. My friend is a small business owner. He pays nearly $1100.00 per month for insurance policy to cover his family. He said words I have never heard him say when teachers and retirees began to complain about $11.00 or $22.00 per month. People are struggling to put food on the table and Perdue does not get it.Forget the personal attacks, focus on the suffering of the people who are slaving to make ends meet. Is that what Republicans are doing frances? focusing on the suffering? What slaving people were we helping again? Give me a name. Let me guess… the millionaire living on figure eight island? Joe the mechanic in Lenoir county who wants to trap foxes? Seriously. Please point me to the meaningful legislation. I’m really not sure what you’re whining about. If the Republicans were smart, they threw in a couple of softballs just so Perdue could veto them. I know you don’t typically need a reason to villanize the opposition, but this will make it a little easier right? Admittedly, catching her defending health insurance for teachers and people trying to educate themselves isn’t exactly the smoking gun. Next time maybe she’ll fight for the wellfare recipients or the drug users, or… oh, I’ve got it. The Mexicans. Boy, that would really motivate the troops eh? How is the State going to fund a health system in debt $550 million with the debt we have? Whinning, when we are in debt with no way to pay? I know of one millionaire and the rest of the people are trying to make a living. Your own prejudices are your worst enemy. All the things you write about have such a sweet ring if we had all the money in the world. But we do not. We must tax the rich but we must ask people like teachers and state employees to help pay for their health insurance. Our local community college president wanted the bill passed for the loans. His worry was default and the possible loss of funds. Go yell at him, I am sure he is wrong. Voter ID, I have a county you need to work an election cycle. You have no idea about the fraud that takes place. The NCAE supported the removal of testing. I wonder why. I can feel you mental superiority in your writing. The State Health Plan benefit is equivalent to pre-tax earnings for state employees of about $400 per month. The full cost of employee plus dependent coverage is about the same as the private sector. The issue of the employee paying the premium from taxable earnings is that it is essentially a pay cut. Since that long-standing covenant has been breached it can be expected that the employee contribution would increase over time. Teachers and state employees already help pay for their health insurance by earning every penny of it. So does the small business owner. Go back to work Greg. Quite frankly, I really don’t care what’s goin on. Jus deal with it. What do you all want from me? I already have my money. I am a millionaire that don’t care about poor people. So good bye and please don’t comment on what I said. Thank you. Very much.